Both oriented cell divisions and cell rearrangements are critical for proper embryogenesis and organogenesis. However, little is known about how these two cellular events are integrated. Here we examine the linkage between these processes in chick limb cartilage. By combining retroviral-based multicolor clonal analysis with live imaging, the results show that single chondrocyte precursors can generate both single-column and multi-column clones through oriented division followed by cell rearrangements. Focusing on single column formation, we show that this stereotypical tissue architecture is established by a pivot-like process between sister cells. After mediolateral cell division, N-cadherin is enriched in the post-cleavage furrow; then one cell pivots around the other, resulting in stacking into a column. Perturbation analyses demonstrate that planar cell polarity signaling enables cells to pivot in the direction of limb elongation via this N-cadherin-mediated coupling. Our work provides new insights into the mechanisms generating appropriate tissue architecture of limb skeleton. A central question in modern biology is how cells build a complex tissue within a four dimensional (xyz and t) context. This is particularly true in developing embryos, in which cells undergo intricate behaviors including proliferation, migration and differentiation, while interacting with similar as well as distinct cell types. Two fundamental cellular processes, oriented cell divisions and cell rearrangements, play important roles during tissue growth (Morin and Bellaïche, 2011; Walck-Shannon and Hardin, 2014). By orienting the axis of division in a stereotypic direction, oriented cell divisions serve two major purposes: first they can drive body axis elongation, as seen in zebrafish gastrulation (Gong et al., 2004); second, they can generate cellular diversity, for example by asymmetrically segregating cell fate determinants to produce one stem cell and one differentiated cell, as observed during Drosophila spermatogenesis (Yamashita et al., 2003). Cell rearrangements involve cells exchanging neighbors, which can occur via different mechanisms. One scenario involves junctional remodeling whereby adherens junctions between cells shrink in one direction and extend in the orthogonal direction, as seen in Drosophila epithelia tissues (Bertet et al., 2004). A second example is by mediolateral cell intercalation, as exemplified by notochord cells during Xenopus gastrulation (Wallingford et al., 2000). Both oriented divisions and cell rearrangements can establish and maintain polarized cell organization that subsequently drives body axis elongation (Gillies and Cabernard, 2011; Lau et al., 2015). For technical reasons, studies of cellular rearrangement have primarily focused on either slowly dividing or postmitotic cells (Gillies and Cabernard, 2011; Lau et al., 2015). Thus, it remains a significant challenge to determine how these cellular behaviors are controlled, coordinated and propagated in proliferative tissues. The growth plate cartilage of the limb is a good example of such a tissue due to its proliferative capacity and stereotypic architecture (Kronenberg, 2003; Lefebvre and Bhattaram, 2010). Along the proximodistal axis of the tissue, chondrocytes undergo progressive maturation and collagen deposition; once terminally differentiated, hypertrophic chondrocytes are replaced by osteoblasts that lay down a calcified matrix to form long bones (Figure 1a) (Kronenberg, 2003). The directional growth of proliferative chondrocytes is critical for normal cartilage homeostasis, morphogenesis and regeneration (Dodds, 1930; Li and Dudley, 2009; Le Pabic et al., 2014). Developing chondrocytes have several hallmark features: they acquire an ellipsoidal shape and orient mitotic figures orthogonal to the tissue proximodistal (PD) axis; clonally related cells are thought to be arranged in columns along the PD axis (Dodds, 1930; Li and Dudley, 2009; Le Pabic et al., 2014). Based on these observations, it has been proposed that chondrocyte column formation is comprised of sequential steps of oriented division and subsequent cell rearrangement (Figure 1b) (Dodds, 1930). Diversity of clone morphology in growth plate cartilage. (a) Schematic diagram of growth plate cartilage. The tissue is comprised of three major growth zones along its proximodistal axis: resting (RZ), proliferative (PZ), and hypertrophic (HZ). The progenitor resting chondrocytes are spherical and dispersed whereas proliferative cells are ellipsoidal and more regularly arranged. The enlarged hypertrophic cells are terminally differentiated and are subsequently replaced by osteoblasts. (b) A simple model to explain column formation of proliferative cells involves oriented division orthogonal to the proximodistal axis followed by cell rearrangement. (c) The principle of viral-based multicolor clonal analysis. A mixture of recombinant replication-incompetent avian (RIA) retrovirus with distinct fluorescent markers is injected into chicken limb buds. If the simple model is correct, only single columns with distinct and uniform monocolor should be visualized in cartilage. (d–g) Distinct clone morphologies in the resting and the proliferative zones. 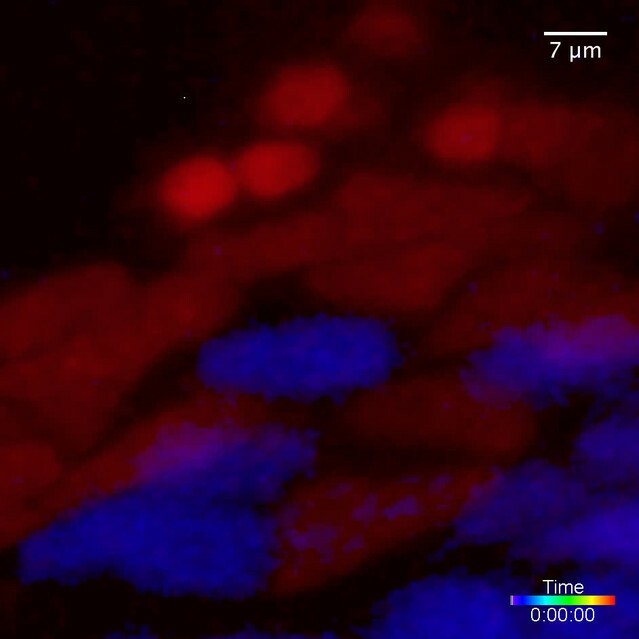 Frozen tissue sections infected with RIA viruses expressing CFP (blue), GFP (green), membrane-GFP, mCherry (red) and H2B-mCherry (red) were counterstained with phalloidin Alexa-647 (gray), and imaged using confocal microscopy (d, f). Some clones displayed magenta or cyan due to viral coinfection of progenitor cells. While the growth direction of resting clones was arbitrary (d) (n = 30), proliferative clones were arranged in either single or multi-columns that appeared to be mainly in the growth direction (f1, f2) (n = 46). Some multi-columns were intermingled with neighboring clones (white arrow, f1). Schematic diagrams were drawn to highlight different clone morphologies (e, g). (h) Quantitative characterization of clone morphology. For individual clones with more than two cells, the angle (Φ) between the minor axis of each cell relative to the tissue proximodistal axis was measured (h1). The mean Φ in the proliferative and resting regions was 12° and 42°, respectively. See also Figure 1—figure supplement 1. The standard deviation (SD) of Φ in the proliferative zone was 3° (h2) (n = 18), smaller than cell orientation (12°), demonstrating these cells stacked in rows. See also Figure 1—source data 1. (i) Distinguishing single and multi-columns. Within individual proliferative columns, the orientation (θ) between the topmost cell (cell 1) and all the other cells was quantified (i1). Using 12° as a threshold, if the SD of θ was lower than this value, the column was grouped as a single column (n = 29); otherwise, we called it complex one (n = 20) (i2). See also Figure 1—source data 2. (j) Column orientation analysis. A polygon was drawn along the borders of columns, and the orientation of the major axis of the polygon to the proximodistal axis was measured (j1). While most single columns were generally parallel to the growth direction (mean orientation was 11.77°) (n = 21), multi-columns were slightly shifted with higher variations (mean orientation was 22.82°) (n = 21) (j2). See also Figure 1—source data 3. Scale bars: 15 μm. ** denotes p<0.01, NA denotes not significant (Wilcoxon Rank-Sum Test). There are several issues with this simplistic model for chondrocyte column formation. First, the relationship between clones and columns is not clear. Although this simple model predicts that clonally related cells form a single column, some studies suggest that columns may be more complex, with two to three adjacent stacks (Li and Dudley, 2009; Ahrens et al., 2009). Further complicating the analysis of the embryonic growth plate cartilage, columnar structure cannot be visualized histologically (Li and Dudley, 2009). Planar cell polarity (PCP) signaling previously has been suggested in coordinating oriented division and column formation in developing growth plate cartilage (Li and Dudley, 2009; Le Pabic et al., 2014; Gao et al., 2011). However, these studies were based on static analyses, making it difficult to determine whether and how cell rearrangements are affected when PCP signaling activity is abnormal. To tackle the relationships between oriented division and cell rearrangement in a definitive way, here we develop and apply novel retroviral-based multicolor clonal analysis to the developing limb skeleton of chick embryos. The results show that clonally related cells are arranged in either single columns, or multi-dimensional ones often derived from a single progenitor cell. 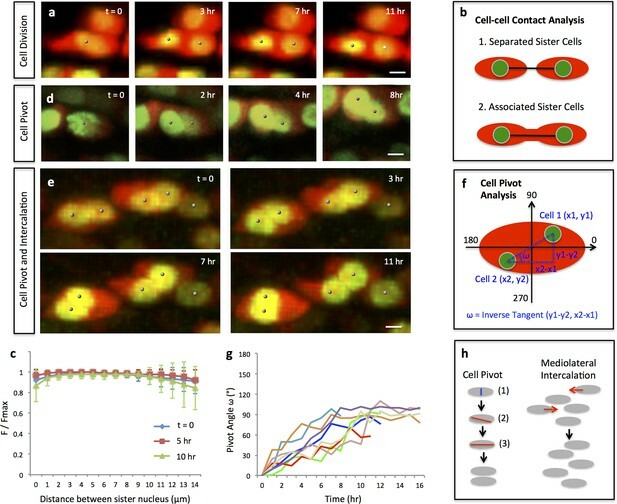 Live imaging demonstrates that single columns are generated through a pivot-like process that reorients sister cells orthogonal to their original orientation. In contrast, multi-column clones likely form by mediolateral cell interaction, similar to cell behaviors in zebrafish craniofacial cartilage (Le Pabic et al., 2014). Focusing on the mechanisms underlying single column formation, we show that after cytokinesis N-cadherin is enriched in the post-cleavage region, enabling sister cell association during their subsequent pivot. We further reveal that PCP signaling couples oriented division with cell pivoting by regulating the expression level of junctional N-cadherin. Taken together, our results suggest that mitosis and cell rearrangement are highly coordinated to control proper tissue architecture of growth plate cartilage. Understanding dynamic interactions between clonally related and neighboring unrelated cells requires accurate discrimination of clonal boundaries together with observation of cell behaviors over time. To meet this challenge in limb cartilage growth, we developed a multicolor clonal approach in which replication-incompetent avian (RIA) retrovirus encoding distinct fluorescent proteins were simultaneously infected into chick limbs so that individual clones are marked by distinct colors (Figure 1c). Three factors further facilitated the assessment of clonality: first, viral insertion sites in the host chromosomes affected protein expression levels such that even clones with the same color can be distinguished from one another by virtue of fluorescence intensities; second, in some cases, more than one virus infected a single progenitor cell to create a new color that expanded the spectrum of rainbow analysis; third, some identical-colored fluorescent proteins were genetically modified so that that they were targeted to different subcellular localizations. If a chondrocyte column is derived from a single progenitor, this column would be unambiguously monocolor (Figure 1c); alternatively, a polyclonal column would display multiple colors with salt-and-pepper distribution. By measuring the orientation of columns in the proliferative zone, we further revealed that while single columns extended along the tissue proximodistal axis, multi-column clones were slightly shifted, but were still organized in contrast to the arbitrary arrangement of clones in the resting zone (Figure 1j). This raises an intriguing question regarding what mechanisms underlie polarized growth of proliferative clones. Below we address this question, focusing on regulation of single column formation. Proliferative cells divide orthogonal to the direction of growth (Dodds, 1930). Therefore, daughter cells must reorganize in order to stack into single columns oriented along the proximodistal axis. As a first step in exploring the cellular mechanisms driving this cell rearrangement, we followed live chondrocytes to determine their spatiotemporal dynamics. To clearly visualize dividing cells, we used a bicistronic RCASB (replication-competent avian retrovirus with B coat envelope protein) that simultaneously encodes H2B-GFP and mCherry to fluorescently label both nuclei and cytoplasm. Later, the infected metacarpals--small elements of limb cartilage—were mounted on homemade culture dishes (Li et al., 2015) for live imaging by one-photon confocal microscopy. Using quantitative analyses of cell trajectories, we confirmed that chondrocytes undergo oriented divisions orthogonal to the proximodistal axis (Figure 2a) (Figure 2—figure supplement 1) (Video 1). In addition, we noted that after cytokinesis sister cells remained connected to each other (Figure 2b and c) and some started to reorient into columns (Figure 2d) (Video 2). Single and multi-columns are generated by distinct cell rearrangements. (a) Oriented cell division in the proliferative zone. Live imaging was performed on the chick metacarpal explants expressing H2B-GFP (green) and mCherry (red) via replication-competent avian retroviral (RCAS) infection. Sister cells appeared to be positioned orthogonal to the tissue proximodistal axis and physically coupled after cytokinesis. See also Figure 2—figure supplement 1. (b, c) Quantitative analysis of sister cell contact. Polyline kymograph analysis of the cytoplasmic mCherry intensity (red) was conducted between the nucleus of two sister cells (green). The intensity was divided by the maximum intensity found alone the line for normalization (F/Fmax). For individual dividing pairs, T = 0 was the time when two daughter nuclei formed. If sister cells separate later (b-1), the F/Fmax curve should display an inversed bell shape; if the F/Fmax curve remains flat, it means the two cells are physically associated (b-2). This method confirmed sister cells remained in contact 10 hr after cytokinesis (n = 5) (c). See also Figure 2—source data 1. (d, e) Snapshots of cell pivot and mediolateral intercalation in the proliferative zone. In d, one mother cell produced two daughters started to rearrange their relative positions (The signal intensity of the images in d was adjusted from the corresponding movie to present nucleus morphologies more clearly). In e, on the left, two laterally aligned sister cells (cell doublets) reorganized their orientations and consequently stacked into a single column; on the right, three cells underwent intercalation: they were arranged laterally positioned at time 0; afterwards, the right and left intercalated toward the middle at 11 hr. (f) Schematic diagram to show the calculation of pivot angle (ω) that is between the plane of sister cells and the mediolateral axis of the tissue. Imaging software IMARIS was used to generate the coordinates of the cells (x, y) that were further applied to the provided equation to calculate ω at different time points. (g) Sister cells underwent pivot. ω of individual sister pairs was plotted against time and presented as individual lines in the graph. T = 0 was the time when sister cells were started to be observed, and ω at this time point was normalized to 0° for the ease of comparison. Most pairs (7/8) were initially aligned lateral to each other (low ω at time 0) and then underwent pivot (progressive increase of ω) into a single column (ω was between 70–100°) along the tissue proximodistal axis (n = 8). The maximal limit of y axis was set to 180° because the pivot angles of some cells were larger than 90°. Noticeably, one pair underwent partial pivot for about 50° only (red line). See also Figure 2—source data 2. (h) Schematic diagrams showing how distinct types of cell rearrangements generating corresponding columns: cell pivot behavior produces single columns whereas intercalation refines multi-columns. The blue and red lines stand for cleavage furrow and post-cleavage furrow, respectively. Scale bars: 4 μm. 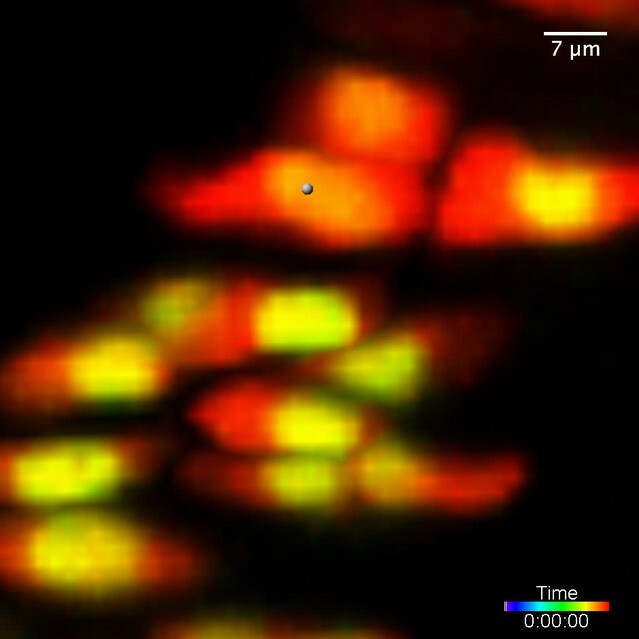 Live imaging of oriented cell division in the chick metacarpal expressing H2B-GFP (green) and mCherry (red). Live imaging on the chick metacarpal expressing H2B-GFP (green) and mCherry (red). 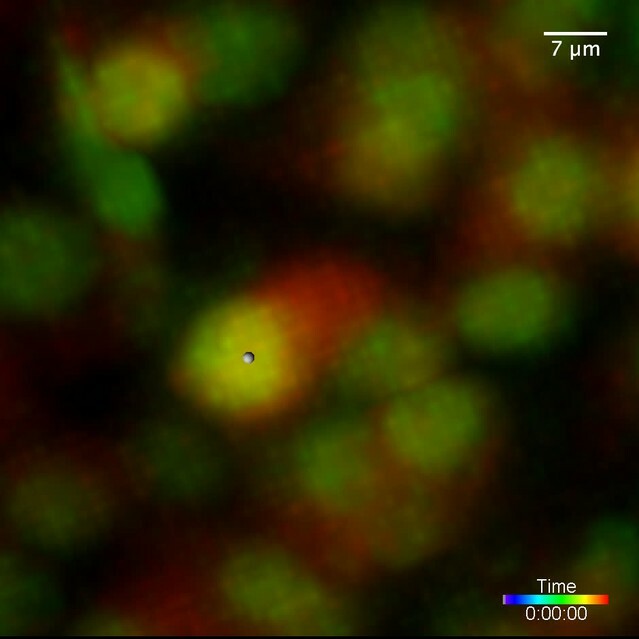 We observed many cell doublets whose tight association made it highly likely that they were sister cells. Focusing on these cell doublets, we noted that they were initially aligned with each other along the mediolateral axis of the tissue, consistent with the possibility that they had recently undergone cytokinesis (Figure 2e) (Video 3). Subsequently, one cell pivoted orthogonal to the other cell, resulting in stacking one atop the other (Figure 2e, f and g) (Video 3). We refer to this cell behavior as ‘cell pivot’ to reflect the morphological change over time (Figure 2h). Live imaging of two pivoting cells (left) and three intercalating cells (right) in the chick metacarpal expressing H2B-GFP (green) and mCherry (red). Whereas cell intercalation has been proposed to underlie skeletal growth, very few studies have been performed on “cell pivot” behavior in the developing limb skeleton (Ahrens et al., 2009; Le Pabic et al., 2014; Romereim et al., 2014; Li et al., 2015) Therefore, we next probed how cell pivoting is regulated at molecular level. Previous work including our own work have demonstrated that cartilage and surrounding perichondrium express the main PCP components including Frizzled-7, Vangl-2, Dishevelled-2, and all are required for oriented division and cartilage tissue architecture (Li and Dudley, 2009; Le Pabic et al., 2014; Gao et al., 2011; Sisson et al., 2015; Hartmann and Tabin, 2000; Sisson and Topczewski, 2009; Kuss et al., 2014). However, all these studies have solely relied on static observations leaving open the questions of whether and how PCP signaling might influence cell rearrangement in space and time. To analyze these questions in a dynamic manner, we turned to live imaging together with molecular perturbation. To this end, we took advantage of a truncated version of Frizzled-7 (Fzd7) lacking the PDZ binding domain (Fzd7-ΔPDB) that functions as a dominant-negative mutant (Kuss et al., 2014) and disrupts normal chondrocyte cell polarity in developing chick cartilage (Li and Dudley, 2009). By co-infecting A coated virus (RCASA) harboring the Fzd7-ΔPDB mutant together with RCASB-H2B-GFP-2A-mCherry into chicken limbs, we achieved super-infection, such that many fluorescently labeled cells became rounder and disorganized (Figure 3—figure supplement 1) undergoing cell division in arbitrary directions rather than along the mediolateral axis (Figure 3a) (Figure 3—figure supplement 2) (Video 4). Interestingly, despite their misorientation, sister cells remained physically coupled (Figure 3a and b) and underwent pivot behavior (Figure 3c and d) (Video 5). Oriented cell division and cell pivot are differentially regulated by PCP signaling. (a, b) Misoriented division and physical coupling of sister cells in the presence of Fzd7-ΔPDB. Live imaging was performed on the chick metacarpals expressing H2B-GFP (green), mCherry (red) and Fzd7-ΔPDB via RCAS infection (a). mCherry intensity analysis confirmed the sister cells were connected after cytokinesis (n = 5) (b). See also Figure 3—source data 1. (c, d) Normal pivot behavior of Fzd7-ΔPDB expressing cells. Among 18 cell doublets, seven pairs underwent pivot to form single stacks. Though their division orientation was not along the mediolateral axis (See also Figure 3—figure supplement 2), these orientation (T = 0) was normalized to 0° for the ease of comparison with wild-type cells in Figure 2g. Note one pair underwent partial rearrangement after division (red line). See also Figure 3—source data 2. (e–h). In the tissues with exogenous DVL2- ΔPDZ, sister cells were associated after cytokinesis (e, f) (n = 5) and 35% cell doublets were rearranged (g, h) (n = 20). The signal intensity of the images in g was adjusted from the corresponding movie to present nuclei morphologies more clearly. See also Figure 3—source data 3, Figure 3—source data 4. (i–l) In the tissues expressing Fzd7 (i, j) or Vangl2 (k, l), cells did not divide along the mediolateral axis (i, k), and were separated within 5 hr after cytokinesis (n = 5 for both cases) (j, l). No rearrangement was observed between cell doublets in the presence of Fzd7 (n = 18) or Vangl2 (n = 16). See also Figure 3—source data 5, Figure 3—source data 6. Scale bars: 4 μm. Live imaging of misoriented cell division in the chick metacarpal expressing H2B-GFP (green), mCherry (red) and Fzd7-ΔPDB. Live imaging of two pivoting cells in the chick metacarpal expressing H2B-GFP (green), mCherry (red) and Fzd7-ΔPDB. Given the above results, we predicted that Fzd7-ΔPDB expressing sister cells would still stack into rows but that these rows would not be aligned along the proximodistal axis. To test this prediction by clonal analysis in vivo, we infected chick cartilage with RIA viruses that tag Fzd7-ΔPDB positive clones with distinct fluorescent markers, and subsequently examined their morphologies in frozen tissue sections (Figure 4a). Focusing on clones with single cell diameter, they were stacked (Figure 4b and c), but rather than forming columns in the direction of tissue growth, clone orientation was largely arbitrary (Figure 4d), suggesting that PCP pathway is required for normal oriented division but not for cell pivoting. Clonal analysis confirms the roles of PCP signaling. (a) Recombinant viruses RIA-Fzd7-ΔPDB-T2A-CFP, RIA-Fzd7-ΔPDB-T2A-mCherry and RIA-Fzd7-ΔPDB-T2A-YFP were mixed and injected into chick limb buds; at later stages, clone morphologies were examined in the frozen cartilage sections. An arbitrarily arranged clone (blue, a1), single-row clone with normal (red, a1) or shifted (yellow, a1) orientation, multi-row clones (a2) were observed. (b–d) Quantitative analysis of Fzd7-ΔPDB positive clone morphology. The same method in Figure 1h–j was applied. Briefly, the standard deviation (SD) of the angles between clonally related cells to the tissue proximodistal axis (Φ) was calculated to identify stacked (n = 22) (SD <12°) and arbitrarily arranged clones (n = 14) (SD >12°) (b). Within each stacked clone, we further measured the SD of θ, the orientation of the topmost cell relative to all the other cells. The results showed that these clones exhibited either single (n = 22) or complex (n = 12) width (c) and they were not parallel to the proximodistal axis (d) (n = 13 and 8 for single and multiple stacks, respectively). See also Figure 4—source data 1, Figure 4—source data 2, Figure 4—source data 3. (e, f) In the tissues expressing Fzd7-T2A-CFP, Fzd7-T2A-mCherry and Fzd7-T2A-YFP at clonal density, the clonally related cells appeared to be arbitrarily oriented without forming stacks (e). Consistently, the SD of the angles between these cells to the proximodistal axis (Φ) was larger than 12° (n = 16) (f). See also Figure 4—source data 4. (g) Schematic diagrams to illustrate different cell pivot behaviors under various perturbation conditions. With low PCP activity, cells divide in a misoriented manner followed by sister cell association and pivot. In contrast, with enhanced PCP activity, while cells still undergo misoriented divisions, the sister cells become separated and fail to rearrange. Scale bars: 15 μm. ** denotes p<0.01, NA denotes not significant (Wilcoxon Rank-Sum Test). As a second method of perturbing the PCP pathway, we used a dominant-negative mutant of Dishevelled-2 that lacks the PDZ domain (DVL2-ΔPDB) such that it strongly inhibits the PCP pathway with little or no effect on canonical Wnt signaling (Li and Dudley, 2009). The cell phenotypes observed after DVL2-ΔPDB treatment were similar to those in Fzd7-ΔPDB expressing tissues (Figure 3e–h) (Video 6) (Video 7). Further supporting a specific roles of PCP pathway in controlling this polarized cell behavior of chondrocytes, previous perturbation analyses of β-catenin in both chick and mouse cartilage ruled out a function for canonical Wnt pathway in oriented cell division or cell morphology (Li and Dudley, 2009; Ahrens et al., 2011). Live imaging of misoriented cell division in the chick metacarpal expressing H2B-GFP (green), mCherry (red) and DVL2-ΔPDZ. Live imaging of two pivoting cells in the chick metacarpal expressing H2B-GFP (green), mCherry (red) and DVL2-ΔPDZ. One unique feature of PCP signaling in vertebrates is that gain- and loss-of-function analyses produce similar phenotypes (Park et al., 2005). One interpretation of this observation is that the levels of PCP proteins on the cell membrane must be tightly regulated for proper signal transduction (Park et al., 2005). To test this, we asked whether activating PCP signaling would phenocopy the loss-of-function phenotype in cartilage. To this end, we utilized either full-length Fzd7 or Vangl2, which is membrane-bound in cartilage (Gao et al., 2011), to promote PCP activity. RCAS expression of either transgene disrupted normal cell morphology (Figure 3—figure supplement 1) and oriented division in developing cartilage (Figure 3i and k) (Figure 3—figure supplement 2) (Video 8) (Video 9), similar to loss-of-function phenotype; however, sister cells became separated and failed to stack into columns (Figure 3j and l). Accordingly, clonally related cells expressing Fzd7 were arbitrarily arranged (Figure 4e and f). Live imaging of misoriented cell division and sister cell separation in the chick metacarpal expressing H2B-GFP (green), mCherry (red) and Fzd7. 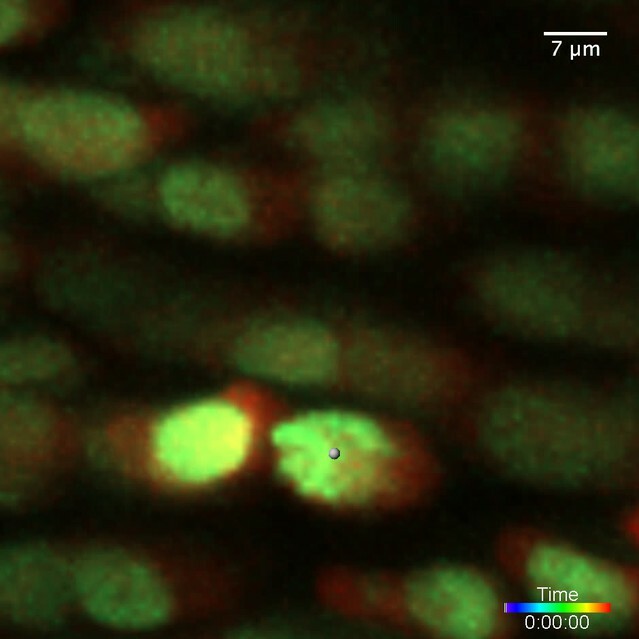 Live imaging of misoriented cell division and sister cell separation in the chick metacarpal expressing H2B-GFP (green), mCherry (red) and Vangl2. Together with the loss-of-function studies, these results show that oriented division is sensitive to both high and low PCP activity, whereas cell pivot behavior is only inhibited by high PCP activity (Figure 4g). Hence, these two cellular events are coupled but respond differently to the level of PCP signaling. The finding that gain (Fzd7) versus loss (Fzd7-ΔPDB) of PCP signaling cause opposite effects on cell pivot behavior raised the intriguing possibility that the PDB domain may play a role in this process. In epithelia cells, this domain is essential for the subcellular localization and signaling specificity of Fzd (Wu et al., 2004). To test this possibility in chondrocytes, we introduced either Fzd7-YFP or Fzd7-ΔPDB-YFP fusion into chick limbs, using the YFP marker since good antibodies to chick Fzd7 were not available. Interestingly, Fzd7-YFP was distributed on both the cell membrane and within the cytoplasm (Figure 5a and f) (Figure 5—figure supplement 1) whereas Fzd7-ΔPDB-YFP was largely localized to the cytoplasm (Figure 5b. 5 f). These results suggest that cell pivot behavior is blocked by excess membrane-bound PCP components. The subcellular localization of Frizzled-7 is determined by its PDB domain. 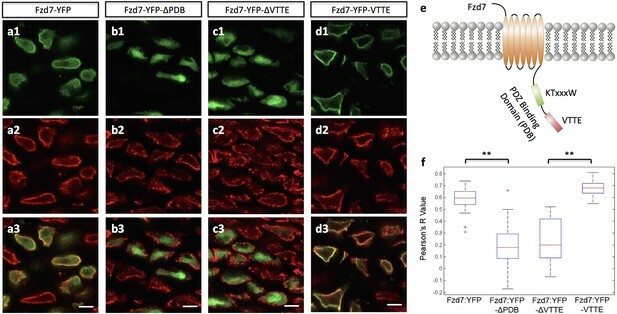 (a–d) VTTE motif is essential to the membrane localization of Fzd7. Chick humerus expressing different versions of Fzd7-YFP (green) was sectioned and counterstained with phalloidin Alexa-647 (red). Fzd7 was expressed in the cytoplasm and on the membrane (a) (n = 20), but was constrained to the cytoplasm when lacking its PDB domain (b) (n = 29). Removing the VTTE motif from and adding it onto Fzd7 promoted protein cytoplasmic and membrane localization, respectively (c, d) (n = 15 and 33 in d and e, respectively). See also Figure 5—figure supplement 1. (e) Schematic diagram of the PDB domain of Fzd7: two motifs KTxxxW and VTTE are predicted to bind to other signaling proteins. (f) Subcellular localization of different Fzd7 mutants were examined by calculating Pearson correlation coefficient to quantify the colocalization between YFP and phalloidin (one represents perfect correlation and −1 represents perfect anti-correlation). See also Figure 5—source data 1. Scale bars: 5 μm. ** denotes p<0.01(Wilcoxon Rank-Sum Test). Because membrane localization of Fzd7 is determined by its PDB domain that contains two motifs (KTxxxW and VTTE) to mediate protein-protein interaction (Wong et al., 2003) (Figure 5e), we next sought to tease apart the roles of these two motifs by removing each of them individually from Fzd7 and examining the subsequent effect on Fzd7 localization. Whereas the KTxxxW truncated version displayed membrane and cytoplasmic distribution similar to that of intact Fzd7 (data not shown), the VTTE truncated mutant was constrained to the cytoplasm (Figure 5c and f), similar to Fzd7-ΔPDB-YFP. Hence, the VTTE motif is critical for membrane localization of Fzd7-YFP. Further supporting this, we found that adding the VTTE motif onto the C-terminus of Fzd7 promoted membrane binding (Figure 5d and f) (Figure 5—figure supplement 1). Given that high expression levels of Fzd7 result in sister cell separation, we asked whether there might be disruption of cell adhesion molecules. PCP proteins have been shown to promote internalization of cadherins from the membrane and adherens junctions in epithelial cells (Warrington et al., 2013; Nagaoka et al., 2014). Additionally, cadherins are important to normal limb chondrogenesis and craniofacial skeletal growth (Oberlender and Tuan, 1994; Romereim et al., 2014). Hence, we hypothesized that in growth plate cartilage, excess membrane-bound Fzd might prevent cell pivoting by reducing local cadherin concentration. To test this hypothesis, we first examined the expression pattern of N-cadherin (Ncad) in the chick limb cartilage. 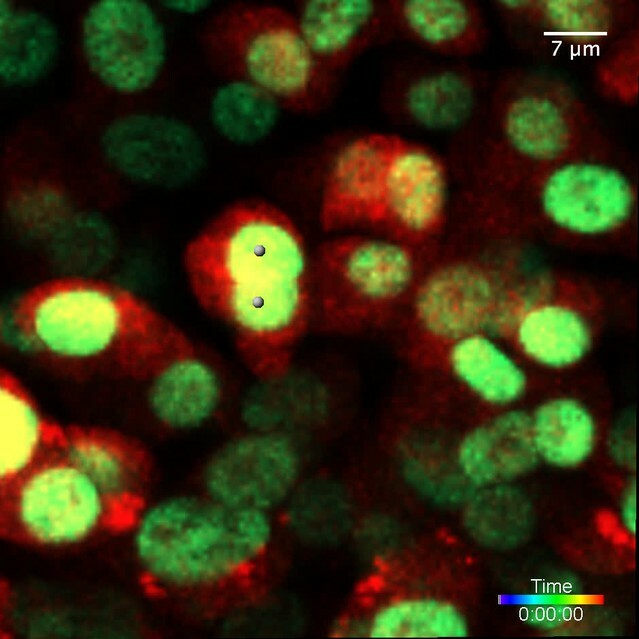 Immunofluorescence demonstrated that Ncad was mainly distributed on the membrane with small amounts within the cytoplasm of interphase cells; however, it was greatly enriched between closely associated cells (Figure 6a, Romereim et al., 2014). Interestingly, counter-staining of contractile rings demonstrated that this sub-population of Ncad was not located in the cleavage furrow (Figure 6—figure supplement 1), but rather concentrated between closely associated cells that appeared to be at post-cleavage stage. PCP signaling controls cell pivot by maintaining the local concentration of N-Cadherin. 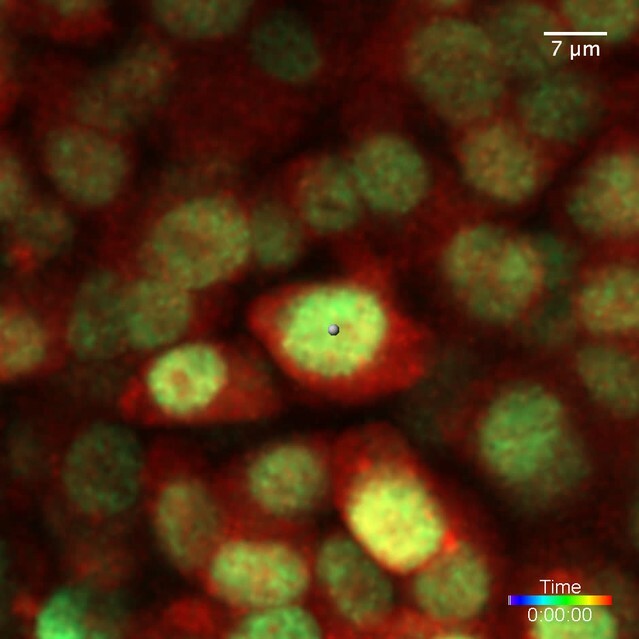 (a–d) Immunofluorescence with α-N-Cadherin (Ncad) antibody (green) and DAPI (red) in the frozen sections of wild-type tissues demonstrated that Ncad was present both on the membrane and in the cytoplasm, particularly enriched in cell-cell junctions (a). These patterns appeared to be unchanged in Fzd7-ΔPDB (b) or Fzd7 expressing cells (c). However, junctional Ncad in Fzd7 positive tissues was reduced (c). This was confirmed by normalizing junctional Ncad intensity to total Ncad intensity in each pair of sister cells (d) (n = 10, 10, eight for wild-type, Fzd7-ΔPDB, and Fzd7 tissues, respectively). See also Figure 6—source data 1. (e–g) In the chick metacarpals expressing Ncad-GFP (green) via RCAS infection, live imaging revealed that the fusion protein was enriched in the interface of sister cells in wild-type tissues (e) (n = 6) and tissues coexpressing Fzd7-ΔPDB (n = 6) over time (f). In contrast, in the presence of Fzd7, Ncad was initially concentrated in the junctions but then diminished as the cytoplasmic bridge between sister cells disconnected (g) (n = 7). (h) Quantifying Ncad-GFP expression along the post-cleavage furrow. GFP intensity was measured every one hour after cell division (T = 1 hr was the time when junctional Ncad-GFP was started to be observed) and normalized by dividing the maximal intensity during the time course (F/Fmax). Changes of cumulative F/Fmax showed that Ncad-GFP signal in Fzd7 expressing cells dropped about 50% 5 hr after cytokinesis. See also Figure 6—source data 2. (i–l) The normal function of Ncad is required for maintaining sister cell contact. 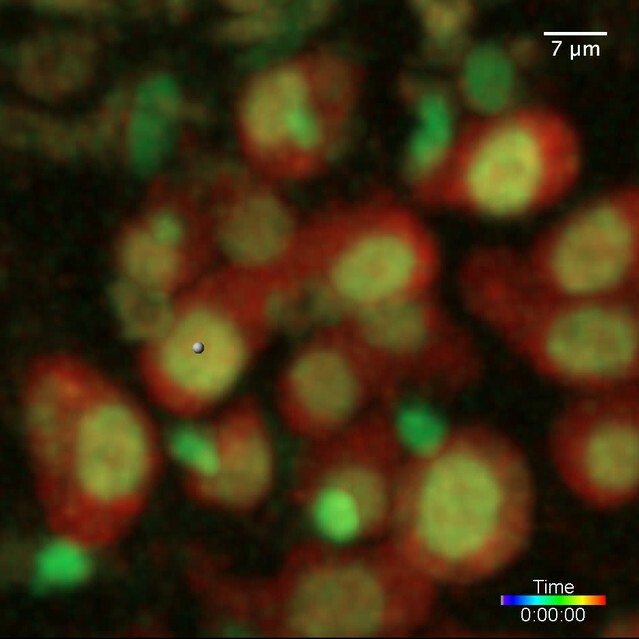 Live imaging was performed on H2B-GFP (green) and mCherry (red) positive tissues cultured in the medium with α-Ncad antibody (1:10 dilution) (i), demonstrating the disengagement of sister cells (j) (n = 5). Similar cell behaviors were observed in the tissues expressing H2B-GFP (green) and a dominant-negative mutant of Ncad fused to mCherry through T2A sequence (red) (k, l) (n = 5). The signal intensity of the images in i was adjusted from the corresponding movie to present nuclei morphologies more clearly. In both cases, no complete pivoting was observed in cell doublets (n = 15 and 20 for α-Ncad antibody and dnNcad-T2A-mCherry, respectively). See also Figure 6—source data 3, Figure 6—source data 4. (m) Schematic diagram to show functional blocking of Ncad causes sister cells to separate. (n) Schematic diagram to summarize the roles of PCP signaling and junctional Ncad in regulating single column formation: (1) the absolute level PCP signaling is essential for oriented cell division, (2) PCP signaling reduces Ncad enrichment at the post-cleavage furrow, (3) normal junctional Ncad function is required for cell association and pivot. Scale bars: 4 μm. ** denotes p<0.01; * denotes p<0.05 (Wilcoxon Rank-Sum Test). We next examined the spatiotemporal dynamics of Ncad expression. To this end, the limb was infected with low-titer RCAS expressing Ncad-GFP fusion. After infection, the developing limbs displayed typical tissue architecture and morphology (data not presented), suggesting low levels of exogenous Ncad did not significantly impact normal growth. 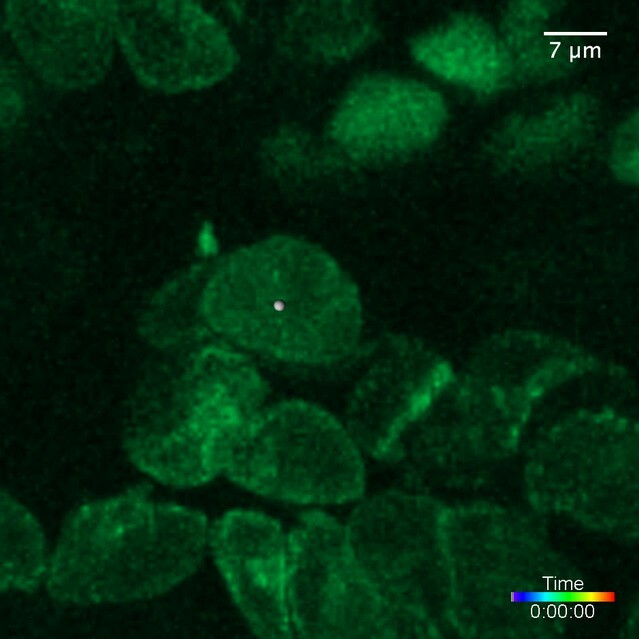 Live imaging revealed a distribution pattern of Ncad-GFP similar to that of endogenous Ncad, with expression on the membrane and inside the cytoplasm (Figure 6e) (Video 10). Importantly, fluorescence intensity of junctional Ncad-GFP was enriched between sister cells and subsequently maintained at a similar level during cell pivot into single columns (Figure 6e and h). These findings demonstrate that Ncad is concentrated at the cell membrane in the post-cleavage furrow. Live imaging on the chick metacarpal expressing Ncad-GFP (green). The tight correlation between junctional Ncad and cell behavior suggests that formation of adherens junctions between sister cells after cytokinesis may be critical for subsequent cell rearrangement. To test this possibility, we imaged metacarpal cultures treated with an antibody that has previously been shown to effectively block N-cadherin function in limb micromass cultures (Oberlender and Tuan, 1994; Gänzler-Odenthal and Redies, 1998). We titrated the supernatant containing this antibody and found that chondrocytes in cartilage explants incubated in medium supplemented with a 1:10 dilution of the supernatant were disorganized (Video 11); under this culture condition, after cytokinesis daughter cells subsequently separated and failed to stack into columns (Figure 6i and j). 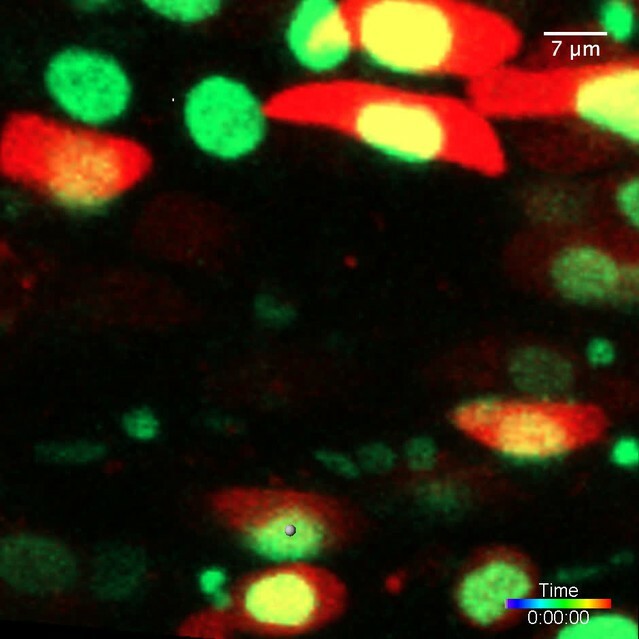 Live imaging of sister cell separation in the H2B-GFP (green) and mCherry (red) expressing cartilage incubated in the medium containing an antibody against Ncad. In order to confirm the role of Ncad, we ectopically expressed a truncated dominant-negative Ncad mutant (dnNcad) that lacks the extracellular domain (Kintner, 1992), and observed similar cellular phenotypes (Figure 6k and l) (Video 12). These data demonstrate that Ncad is functionally involved in chondrocyte cell association and rearrangement (Figure 6m). Live imaging of sister cell separation in the chick metacarpal expressing H2B-YFP (green) and a dominant-negative mutant of Ncad (dnNcad) fused to mCherry with T2A sequence. The defective cell rearrangement after blocking Ncad function is similar to that observed after enhancing PCP activity, prompting us to further test their causal linkage. In the tissues expressing either Fzd7 or Fzd7-ΔPDB, Ncad transcript levels appeared normal (Figure 6—figure supplement 2). Furthermore, immunofluorescence analysis failed to detect obvious differences in the amount of membrane and cytoplasmic-bound Ncad protein when compared with wild-type tissues (Figure 6a–c). In contrast, junctional Ncad was diminished in the Fzd7 expressing tissues (Figure 6c and d), while normal in Fzd7-ΔPDB expressing tissues (Figure 6b and d), consistent with the phenotypes observed after PCP and Ncad perturbation studies. To address how PCP affects the dynamics of junctional Ncad, we performed intensity analysis of junctional Ncad-GFP in developing cartilage. In the presence of Fzd7, Ncad was concentrated in the post-cleavage furrows of the misoriented dividing cells and subsequently maintained at the interface between rearranging sister cells (Figure 6f and h) (Video 13), similar to wild-type cells (Figure 6e and h) (Video 10). However, in the cells with high intact Fzd7, Ncad was initially enriched in the post-cleavage furrows but its local concentration became reduced over time (Figure 6g and h) (Video 14). Live imaging on the chick metacarpal expressing Ncad-GFP (green) and Fzd7-ΔPDB. Live imaging on the chick metacarpal expressing Ncad-GFP (green) and Fzd7. 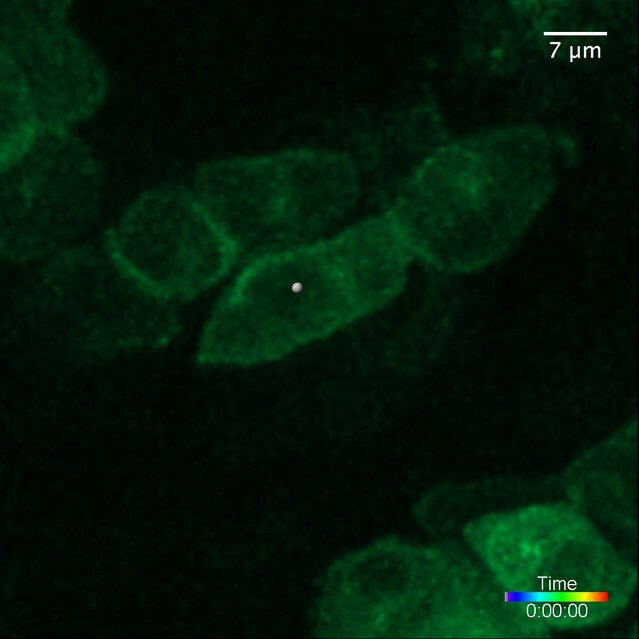 The fact that Ncad-GFP labels the cell membrane (Figure 6e–g) provides a clean means for performing cell segmentation and quantitation to validate sister-cell association. Therefore, we further measured fluorescence intensity changes of this fusion protein across both sisters cell during their rearrangement (Figure 6—figure supplement 3a). The results show that Ncad-GFP was enriched in the junction shortly after cell division. At subsequent times, Ncad was still maintained at cell junctions of wild-type and Fzd7-ΔPDB expressing cartilage (Figure 6—figure supplement 3b–d), but vanished from Fzd7 expressing cartilage. Such patterns were consistent with fluorescence intensity changes of cytoplasmic mCherry during cell pivoting (Figures 2c, 3b and j), confirming physical connection of sister cells in wild-type and Fzd7-ΔPDB expressing tissues, but not after Fzd7 expression. Collectively, our results suggest that PCP signaling inhibits sister cell association and their pivoting via down-regulation of junctional cadherin. In summary, we demonstrate that sister chondrocyte cells, regardless of their orientation during cell division, fail to reorganize into single columns if they do not attach to each other. Although both oriented division and cell rearrangement occur sequentially and are controlled by PCP signaling, the division orientation is not sufficient to initiate cell pivot behavior; rather, cell association mediated by Ncad is critical for their subsequent rearrangement. Taken together, we propose that the occurrence of cell pivot is enabled by cell-cell adhesion downstream of PCP signaling whereas the orientation of the cell pivot is determined by the orientation of preceding division (Figure 6n). In addition to single column clones on which we focused above, we also observed patches of more than two cells in width in the sparsely RCAS infected tissues. Live imaging suggests that some cartilage cells move mediolaterally, in the process of intercalating between neighboring cells (Figure 2e) (Video 3). 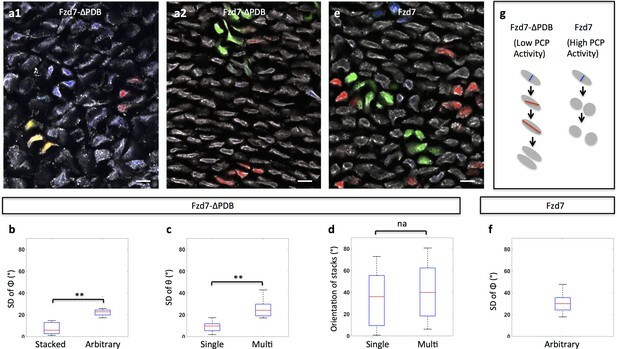 As a consequence, patches became elongated along the proximodistal direction, similar to a well-recognized mode of cell rearrangement that occurs during zebrafish jaw growth (Le Pabic et al., 2014). To further test if the intercalating cells were clonally related and define their spatial-temporal relationships, we examined tissues infected by multicolored RIA viruses. Previous dynamic imaging using two-photon microscopy showed that chondrocyte cell intercalation is a slow process taking more than 48 hr to reach completion (Li et al., 2015). Due to technical constraints involving multiple fluorophore excitation, here we employed one-photon laser that can noninvasively image cartilage explant for up to 24 hr. Although this time period is not sufficient to follow complete intercalation, we observed partial intercalation within the same multi-column clone (Figure 2—figure supplement 2a) (Video 15) (80%), as well as some examples of intercalation between non-clonally related cells (Figure 2—figure supplement 2b) (Video 16) (20%). This existence of both cell intercalation and cell pivoting within clones (Figure 2h) suggests that chondrocytes employ multiple strategies to establish proper tissue architecture. Live imaging on the chick metacarpal expressing membrane-GFP (green) and GFP (green) via RIA infection. Live imaging on the chick metacarpal expressing CFP (blue), mCherry (red) and H2B-mCherry (red) via RIA infection. Previous work on craniofacial cartilage in zebrafish and mouse has provided different interpretations regarding the cellular mechanisms driving chondrocyte cell stacking (Sisson et al., 2015; Romereim et al., 2014). It is notable that the zebrafish work was performed on Meckel’s cartilage (Sisson et al., 2015) whereas the mouse study was focused on presphenoid synchondrosis (Gänzler-Odenthal and Redies, 1998), raising the possibility that different means of cell rearrangements occur in different types of skeletal elements and/or at different developmental stages. By combining live imaging and quantitative analyses in chick embryo, we demonstrate that cell pivoting contributes to normal morphogenesis of growth plate cartilage and further confirm the occurrence of mediolateral intercalation within the same context. Our findings offer new insights into the relationship between oriented cell division and cell rearrangement. The association between these two cellular behaviors has been observed during mouse ureteric bud development and chick gastrulation (Packard et al., 2013; Firmino et al., 2016). In both cases, after cytokinesis, one daughter cell remains in its original position while the other disperses and reinserts at a position several cell diameters away, thus contributing to tissue elongation (Packard et al., 2013; Firmino et al., 2016). In contrast, chondrocytes reorganize within spatially constrained clones by pivot or intercalation behavior into oriented and organized columns in the direction of limb growth. The similarities in chondrocyte behavior in the developing craniofacial (neural crest-derived) and limb (mesoderm-derived) skeletal elements suggest that, during evolution, conserved cellular principles are employed to build cylindrical-shaped skeletons, even though these tissues are derived from different types of progenitor cells. By delving into the molecular mechanisms underlying cell pivot behavior, we demonstrate that PCP signaling differentially influences distinct steps, regulating the orientation of cell division and enabling cells to pivot by controlling Ncad enrichment in the post-cleavage furrow. By this means, chondrocytes divide along the tissue mediolateral axis (cell major axis) due to geometrical constraints (Li and Dudley, 2009) while the resultant clones expand mainly in the direction of tissue growth. Given that proliferative chondrocytes normally are embedded in Collagen 2a and that cells become disorganized in its mutant mice (Barbieri et al., 2003), an intriguing possibility is that the extracellular matrix provides such a constraint. By devising multicolor replication incompetent retroviruses for clonal analysis of chondrocytes, our work enriches the toolkit for cell lineage analysis in amniotes. Previous studies in the chick embryo have utilized sparse labeling with low-titer RIA viruses harboring a single histological marker (Chen et al., 1999). While this method has the advantage of permanently labeling cells and their progeny, it has limitations. First, in order to unambiguously infect a single progenitor, the virus needs to be highly diluted such that individual labeled clones are distant from each other; however, this low labeling density prevents assessment of interactions between neighboring clones. Second, visualizing markers within clones requires histological processing of the specimen that can affect cellular morphology. To meet these two challenges, we have created an RIA based fluorescent labeling technique to achieve combinatorial tagging of multiplex clones, permiting determination of clonal relationship in intact tissues with relatively high labeling density. Compared with Confetti techniques mediated by lentiviral delivery (Loulier et al., 2014), the RIA virus offers better levels of infection in many chick tissues such as retina and limb (Pearse et al., 2007), muscle (Gordon et al., 2009), skin and feather (Li et al., 2013). Importantly, as a VSV-G pseudotyped virus that infect all types of cells, our viral reagents can be easily adapted to study other morphogenetic events in both genetic and non-genetic animal models. In this study, we dissect the complex cellular behavior driving limb skeletal elongation. Our results show that clonally related chondrocytes become arranged in either single or multi-columns along the axis of tissue elongation. These columnar morphologies are generated through two types of cell behaviors: cell pivoting resulting in single columns or cell intercalation resulting in complex columns. The cell pivoting exhibits certain similarities to cell rearrangement in mouse presphenoidal synchondrosis, a type of neural crest-derived craniofacial cartilage (Romereim et al., 2014). The PCP pathway coordinates cell pivoting following mediolateral division. In this way, chondrocytes increase their cell numbers while concomitantly undergoing stereotypical arrangements that result in tissue elongation. Together with the known roles of PCP signaling in determining the morphology of other tissues and organs (Zallen, 2007), this highlights the importance of PCP signaling in shaping tissues via regulating polarized cell behaviors. RIA and RCAS viral vectors were modified by introducing unique AscI and NotI digestion sites to facilitate cloning. For clonal analyses, CFP, GFP, membrane-GFP, H2B-YFP, mCherry, H2B-mCherry, Fzd7-ΔPDB, Fzd7, Fzd7-ΔPDB-T2A-CFP, Fzd7-ΔPDB-T2A-mCherry, Fzd7-ΔPDB-T2A-YFP, Fzd7-T2A-CFP, Fzd7-T2A-mCherry, Fzd7-T2A-YFP were cloned into RIA vector. For cell tagging, protein tagging and perturbation studies, H2B-GFP-T2A-mCherry, H2B-YFP, Ncad-GFP, dnNcad-T2A-mCherry, Fzd7-YFP, Fzd7-ΔPDB-YFP, Fzd7-YFP-VTTE, Fzd7-ΔVTTE-YFP were cloned into RCAS vector. The DNA sequences encoding KTxxxW and VTTE motif are located in the 1633–1650 and 1684–1701 nucleotides of chick Fzd7 gene (NM_204221.2), respectively. In RCAS-Fzd7-ΔKTxxxW-YFP and RCAS-Fzd7-ΔVTTE-YFP, the sequences encoding KTxxxW and VTTE were deleted, respectively. To clone RCAS-Fzd7-YFP-VTTE, the DNA sequence encoding VTTE motif was added to the C terminus of YFP. dnNcad were previously described (Li and Dudley, 2009; Packard et al., 2013), and subcloned into the upstream of T2A-mCherry in RCAS vector. RCAS-Fzd7-ΔPDB, RCAS-DVL2-ΔPDZ and RCAS-Vangl2 were previously published (Li and Dudley, 2009). Recombinant RCAS plasmids were transfected into chick DF1 cells (ATCC, Manassas, VA; #CRL-12203, Lot number 62712171, Certificate of Analysis with negative mycoplasma testing available at ATCC website) in 10 cm culture dishes using standard transfection protocol. The transfected cells were further maintained in 15 cm dishes. When the cells were confluent, the cell culture medium was harvested once per day for three days, and was concentrated at 26,000 rpm for 1.5 hr. The pellet was dissolved in minimal volume of DMEM. Recombinant RIA plasmids were cotransfected with Envelop A plasmid into DF1 cells in 10 cm dishes. 24 hr later, the cell culture medium was harvested once per day for three days, and was concentrated using the same method as RCAS virus. Both RCAS and RIA viruses were injected into chicken (Specific Pathogen-Free chicken, Charles River) right forelimbs at E3 (HH 19–20). The right humerus or metacarpal was dissected at E8 (HH 32–33) for further analysis. Chick humerus was fixed in 4% PFA at 4°C for 30 min. Frozen tissues sections were permeabilized with blocking buffer (1xPBS with: 10% vol/vol normal goat serum, 1% BSA, 0.1% vol/vol Triton-X100, 0.025% sodium azide), stained with primary antibody (1:10 dilution for Rat anti-Ncad, DSHB) and then secondary antibody Goat anti-Rat Alexa-647 (1:500 dilution, Molecular Probes). For double in situ hybridization, hybridization chain reactions (HCR) protocol was employed (Choi et al., 2010). Briefly, fixed frozen tissue sections were incubated with to anti-chick-Ncad and anti-chick-Fzd7 DNA probes for 16 hr at 45 degrees. The samples were further hybridized to the hairpins that contain both gene specific sequences and fluorophores at room temperature for signal amplification. The right metacarpal of chick embryos at E8 was dissected for organ culture. Molten agarose was poured into the fluorodish (World Precision Instruments) and the custom-designed mold was immediately inserted into it. When the agarose was solidified, the mold was pulled out, leaving grooves in the agarose for holding the metacarpals. The metacarpals were submerged in DMEM/F12 growth medium containing 0.2% bovine serum albumin, 50 mM ascorbate acid (Sigma-Aldrich, St. Louis, MO, USA), 10 mM glycerophosphate and 1% glutamine-penicillin-streptomycin (Invitrogen) in a humidified chamber at 37°C on the stage of the inverted laser scanning microscope (LSM 800 inverted, Carl-Zeiss) for live imaging. 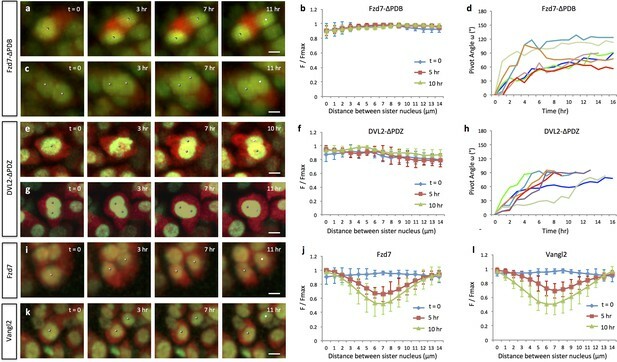 For imaging chick metacarpal expressing H2B-GFP and mCherry, or the combination of H2B-YFP and dnNcad-T2A-mCherry, one-photon laser excitation was used with 0.6% and 0.8% relative power at wavelength of 488 and 561 nm, respectively; for imaging Ncad-GFP, 0.8% relative power at wavelength of 488 nm was used. In all the cases, optical sectioning was achieved at intervals of 1 μm and images were captured very one hour for 12 to 16 hr. The images were imported into IMARIS 7.6.4 for cell morphology and trajectory analyses as previously described (Li et al., 2015). For cell pivot analysis, the x, y coordinates of sister cells were acquired over time. The pivot angle is an inverse tangent function of the distance between the two cells along y and x axis. The angle at time 0 is normalized to 0° for the ease of comparison. The direction parallel to the mediolateral axis of the bone is set to be 0°. All the angles were calculated using MATLAB. Measurement of fluorescence intensity in live and fixed samples with different region-of-interest shapes (including polyline kymograph analysis) was conducted in Image J.
One-sample Kolmogorov-Smirnov test was used to assess the distribution of the datasets. If the datasets were not normally distributed, Wilcoxon Rank-Sum test was used for examining whether the differences between datasets were significant. Watson’s U2 test was used for evaluation the significance of orientation differences. It is also a nonparametric test that does not require the dataset to be normally distributed. The Journal of Neuroscience : The Official Journal of the Society for Neuroscience 18:5415–5425. Current Topics in Developmental Biology 90:291–317. Nature Reviews Molecular Cell Biology 15:34–48. Thank you for submitting your work entitled "PCP signaling coordinates oriented cell division and cell rearrangement in clonally expanding growth plate cartilage" for consideration by eLife. Your article has been reviewed by three peer reviewers, and the evaluation has been overseen by a Reviewing Editor and a Senior Editor. The reviewers have opted to remain anonymous. As can be seen from the reviews the reviewers considered that this was an interesting paper addressing a key aspect of tissue morphogenesis that could, in principle, be suitable for publication in eLife. However all three pointed to a lack of suitable quantification of cell behaviours. There is also concern raised about how intercalation can be distinguished from cell rotation and how this was deduced from the videos and stills. Finally reviewer 1 felt that the use of the Fzd7 PDZ mutant was inappropriate and suggested that better PCP inhibitors should be employed, while reviewer 2 suggested the use of additional markers of the cytokinetic furrow would be necessary for accurate assessment of division planes. While the large number of outstanding issues raised by the referees preclude simply a revision of this version of the paper, we would be happy to consider a new version of the manuscript containing further experiments that address the important points raised during the review process. This manuscript analyses morphogenesis of plate cartilage during limb development. The authors use cell labelling to follow the behaviour of cells in order to explain elongation across the proximal-distal axis. They found that clones of cells are reorganized in columns based in two mechanisms: oriented cell division and cell rearrangements. In addition they explore the role of PCP signalling and N-cadherin in these process. Morphogenesis is a very important topic in general, and the study of orientated cell division and cell rearrangements has become increasingly central to understand development. However, the current manuscript contains too many problems as to be publishable in a journal like eLife. First, some of the conclusions are not supported by the data; second, some important experiments lack a proper quantitative analysis; third, some of the tools used to inhibit PCP signalling or N-cadherin are not properly justified. 2) The data concerning cell intercalation (Figure 2F and G, and Videos 3 and 4) are not convincing; the intercalation is minimal, probably because the video is too short to see a more complete intercalation. 3) The authors claim that "cell rotation happens between sister cells, while cell intercalation takes place mainly between cousin cells", but they do not show any data to support this claim. 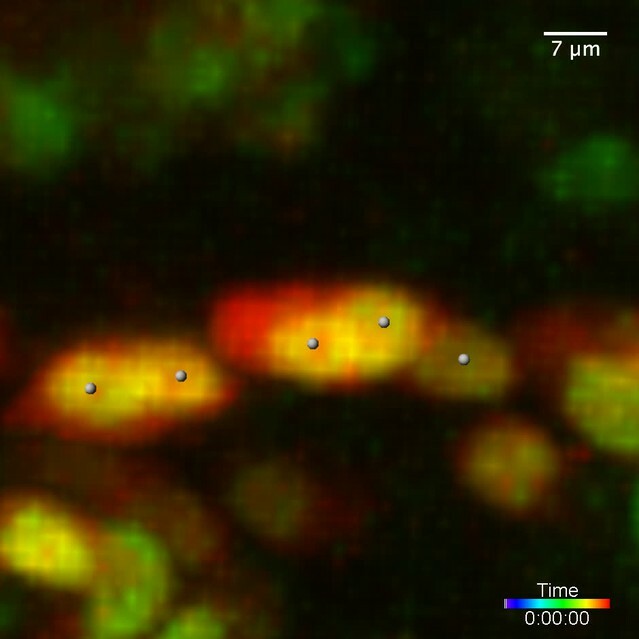 The videos/images included in the manuscript are from different cells undergoing division, rotation or intercalation. In order to show that rotation is happing in sister cells, they need to show in the same time-lapse video that a dividing cell is followed by rotation. 4) The authors use a Fzd7 lacking the PDZ binding domain to inhibit PCP signaling. Fzd7 is the receptor for many Wnt signaling molecules, not all of them being PCP related. It is not clear how the expression of this truncated receptor could inhibit the endogenous Fzd7 activity or be a specific PCP inhibitor. Furthermore, the authors show that this mutated receptor is not localized in the membrane, where the endogenous Fzd7 receptor is expected to be localized. Better PCP signalling inhibitors should be used. 5) The authors study the localization of different Fzd7 mutants by comparing it with phalloidin staining. Fzd7 is a trans-membrane protein and therefore its localization should be compared with a membrane marker and not with cortical actin. In addition PCP signalling is known to affect the cytoskeleton and it is possible that some of the mutants could affect the distribution of actin. Indeed phalloidin staining looks quite different between c2/d2 and b2/e2. 7) The authors use Figure 5C to conclude that Fzd7 overexpression inhibits N-cad localization at the junction between sister cells. However I can clearly see a doublet of cells expressing N-cad at the junction in the bottom of the picture. The other cells shown in Figure 5C that are negative for N-cadherin are not even in contact. These data do not support the author conclusion. This interesting paper applies novel labeling and imaging strategies to advance our understanding of cell behaviors driving elongation of long bones. In principle, it could be an excellent contribution to an important field. However, the paper suffers from a variety of nagging issues with the data. If more careful quantification of the results confirms the claims made here and more care is placed into the writing, the paper should be acceptable for eLife. 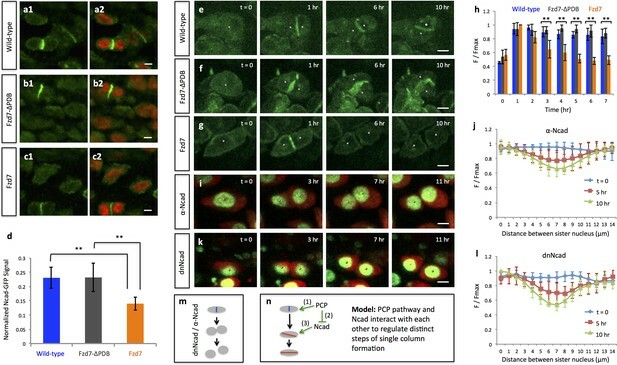 Subsection “Oriented cell division and cell rotation are interconnected but differentially regulated by PCP signaling”. Claims about sister cell separation are made, but no quantification is supplied. Distance between new sisters over time would provide a simple metric for this important observation. In subsection “Influence of PCP signaling on cell rotation involves local enrichment of N-Cadherin in the cell division plane”. The claim is made that N-cad labels the midbody, but surely this is not correct. Also, the definition provided for the midbody (subcellular structure in the midpoint between two future sister) is not accurate. The midbody is formed as the microtubules of the mitotic spindle are bundled together by the cytokinetic furrow. Without tubullin staining this claim cannot be made. Also, I think that not being able to visualize the actual cell membrane during division and "rotation" makes it hard to say what is going on here. What appears to be labelled by N-cad is the cytokinetic furrow, which would also be marked by phospho-myosin or active RhoA. Given the key role of PCP proteins in governing actomyosin contraction, the authors would be well served by examing such markers of the furrow here. Figure 5. What happens to N-cad localization during the process they authors call "rotation" This seems to be an important omission here. In the same section no numbers are provided to back the claim that rotation fails, though this metric has been quantified in other parts of the paper. As above, separation should be quantified. Also in that section the level of N-cad at the "midbody" (more likely the furrow, see above) is not quantified, but must be to support this claim. This paper begins by using clonal analysis to examine cell rearrangements in the growth plate cartilage of the chicken limb. Doing this, they follow two types of cell rearrangements, cell rotation and mediolateral intercalation. They put a lot of emphasis on how they "expand the toolkit for high-resolution clonal analysis in a non-genetic system"; however, this approach seems unsurprising and not particularly novel. Furthermore, it has been thought for many years that chondrocyte columns arise clonally by oriented division followed by cell rearrangement. However, I do think this is a nice, simple system to study the problem and while similar studies have been performed they are arguably too simple (eg zebrafish Meckel's cartilage) or too complex to interpret and not accessible (eg mouse cartilage). First, because the authors set up the paper by introducing their clonal analysis, I expected more detail on single vs complex columns of chondrocytes, perhaps with better definitions and quantitation. These seem like simple concepts, but are not made clear in the text. They state that "cartilage is a mosaic of simple and complex monoclones, with a minor contribution from intermingled clones" What are the criteria for "simple" versus "complex"? How do they distinguish between "complex" columns versus columns that have not finished intercalating? Can you distinguish between misorientation and cell shape change? Also, it seems to me you need more than two cells in order to undergo intercalation (subsection “Complex column formation involves mediolateral cell intercalation”). Second, I was a bit disappointed that the authors did not continue their clonal analyses once they moved into manipulating the PCP pathway. The prediction would have been that by perturbing the PCP pathway, the clones would be unable to reorient or intercalate, which might be easily seen in the clonal analysis. However, instead of going back to the clonal analyses, the authors move toward examining single cell division orientation over a (comparatively) brief period of time. How do we know that these neighbor relationships are now stable (or even if they should remain stable)? So, while I found the Fzd mutational analysis interesting, it seems to me that these experiments don't really address the initial questions and really are much more focused on the immediate effects of division to sister cells, rather than the clonal expansion of the growth plate. Many of the Materials and methods are not very clear. We need more detail on the constructs. For example, in subsection “Excess membrane-bound Frizzled-7 receptor inhibits cell rotation” it states that adding -VTTE motif promotes membrane localization – presumably this is not the WT construct. Does this mean they put the VTTE c-terminal to the YFP? EGTA experiment (presumably some kind of control?) is not explained. The videos do not add much for me as there are no additional intervening frames compared to what is shown in the stills, and I find it difficult to interpret the rotation or intercalation, especially since we have very little sense of the greater context. It would be helpful to see more of a tissue-level snapshot to see the trend overall, rather than individual cells. It would also be much more satisfying to see the clonal analysis over time. (Is it possible to culture these limbs?). Thank you for resubmitting your work entitled "Planar cell polarity signaling coordinates oriented cell division and cell rearrangement in clonally expanding growth plate cartilage" for consideration by eLife. Your article has been re-reviewed by three peer reviewers, and the evaluation has been overseen by a Reviewing Editor and a Senior Editor. Unfortunately all three of the original reviewers, while appreciating that the paper is much improved, still felt that key concerns remain un-addressed in the revised version. These have been clearly enunciated in the three sets of comments. In particular the reviewers highlight the need for a membrane label to more clearly monitor the cell behaviours, as well as the live imaging of the differently coloured clones which are considered insufficiently convincing to discriminate intercalation versus cell pivoting by cells in these columns. Hopefully you'll find the reviewers comments helpful in performing further revisions of the work. This is an improved version of the manuscript and the authors have addressed most of my previous comments. I am still not completely convinced about the quantification shown in Figure 1, as it is not evident from these data how the distribution of frequencies of simple and complex columns is. However this is now a minor point. The authors make use of clonal analysis to follow cellular rearrangements during elongation of the growth plate cartilage in the chicken limb. The initial submission was flawed due to a lack of precision in the original analysis (in defining terms, quantification of data, etc) and in difficulties with seeing and interpreting the relevant cell movements in the data/videos. The writing in this revision is much improved – clearer and more precisely written than in the original submission. Substantial quantitation has been added to the paper. However, I still find myself struggling to see the data that the authors highlight. A major issue in the previous version was the distinction between single and complex columns. I'm still not sure of this: I think Figure 1F1 shows a single column (in red) and the text states that Figure 1F2 shows complex columns in "blue and green clones". Then, the authors go on to say the "a minority of complex ones (8%) intermixed with non-clonally related cells (white arrow pointing to the uninfected cell beside the green clone, Figure 1F1)". What is the justification for calling this a complex column? Don't they have any better examples of mixed color complex columns? 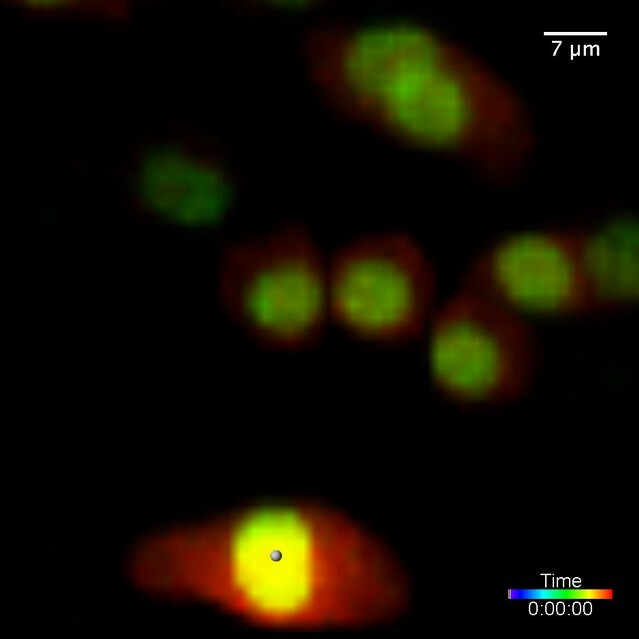 I appreciate the difficulties with live imaging of different colored cell clones; however, the videos are still unsatisfying and are not very definitive with regards to intercalation or "cell-pivoting". The "zoomed-out" view certainly helps. But, the authors argue that they cannot perform live imaging due to the limitations of photo-damage on the tissues. In fact, I think it would have been better to skip the live imaging and take live snapshots at several time points which would allow us to better follow the clones over multiple days. 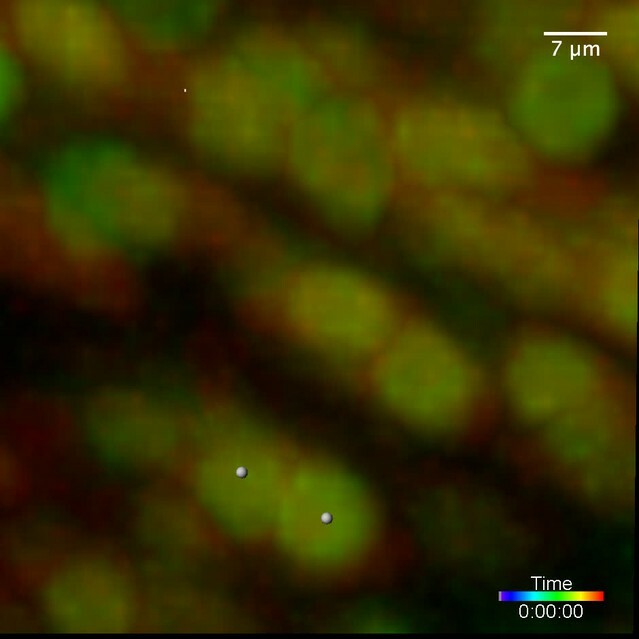 The live imaging would be interesting if we could actually see the cell behaviour/morphology (e.g. something sort of hinted at in the pictures of Fzd7-membrane in Figure 5). Instead, we get none of the benefits of following the clones, and very little appreciation of the actual immediate cellular movements. Finally, doing the single color clone in the PCP perturbations is also not very satisfying, for the same reason above, as it is difficult to understand which columns are "complex stacks" and which are "disorganised". I would disagree with their statement in their Response to Reviewers: "As mediolateral intercalation is well known to be important in cartilage development[…] we chose instead to focus[…]" I do not think this mediolateral intercalation is well-established, as the major evidence is from limited zebrafish Meckel's cartilage studies. The data in this paper still leaves me wondering: does the intercalation actually occur in this system? This revised manuscript is generally improved over the original, as efforts have been made to quantify the observed results. However, concerns do remain. The quantification of cytoplasmic FP intensity does allow the authors say a bit more about the data they obtained, but this is not really the correct fix. As per my original review, the absence of a membrane label is still problematic as it impedes a clear understanding of what is really going on with these cells. Given the complexity of the authors' claims, this remains a considerable issue. In addition, quantification of raw pixel intensity is to a useful metric of N-cad levels for Figure 6D. Typically, this value would be normalized in some way (to a membrane label, or to total signal). We have softened the conclusions to be more circumspect, have improved the quantitation and have improved descriptions to better explain the tools. We thank the reviewer for pointing out that these data were not sufficiently convincing. To address this important point, we have now presented new representative images to show the morphologies of both single and complex columns (Figure 1F1, 1F2). Furthermore, we have performed quantitative analysis to distinguish single from complex columns as well as cells that are not aligned (Figure 1H, 1I). We also have added quantitation to measure column orientation (Figure 1J). The results show that while single columns extended along the tissue proximodistal axis, complex columns were slightly shifted (Figure 1J), but still organized in contrast to the arbitrary arrangement of clones in the resting zone (Figure 1H2) (Figure 1—figure supplement 1). Taken together, this strongly suggests that proliferative but not resting clones are polarized. The reviewers point is well taken. In fact, cell intercalation in growing cartilage is well known to occur during cartilage formation (1, 2). The previous live imaging to follow this long-term process (more than 48 hors) was performed on GFP expressing cartilage using two-photon laser to avoid tissue damage (2). However, here we have to use one-photon laser to track the behaviors of multicolored clones. Unfortunately, this has some inherent limitations with respect to depth of penetration and length of imaging (24 hours or less for cartilage explants). Given these constraints, our results confirm that partial intercalation occurs more frequently between clonally related cells (Figure 2H, 2I) (Supplementary Video 4) (Supplementary Video 5); however, the 24 hr time period is not sufficient to catch the complete cell intercalation process. We now downplay cell intercalation, which was already well known, and only mention these results briefly as it is a minor portion of the paper. In the current version of the manuscript, our aim was to determine the mechanism regulating single column formation. Unlike mediolateral intercalation for complex columns, the mechanism underlying single column formation was not well understood. Therefore, our perturbation studies were focused on the molecular mechanisms driving cell pivot (previously referred to as “cell rotation” in the original manuscript). We have now reorganized the manuscript to focus on our novel results showing the importance of cell pivot to generate simple columns. Our perturbation experiments then go on to test the role PCP signaling and N-cadherin in this pivot process. The reviewer raises an important and valid point. To address this, we have performed additional live imaging and now show a better example of a sister starting to pivot following cell division (Figure 2D) (Supplementary Video 2). 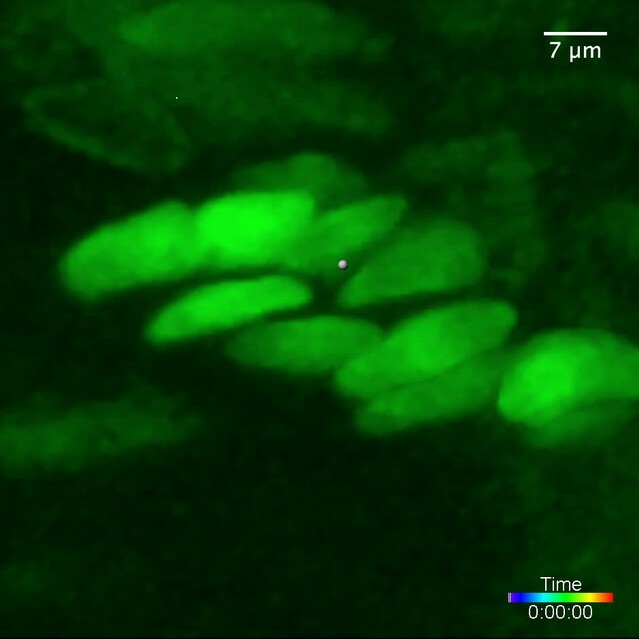 Moreover, we show that chondrocytes that express NcadGFP undergo cell division followed by cell pivot into columns (Figure 6E) (Supplementary Video 12). These combined results support the model of cell pivot between sister cells. The reviewer raises a good point. To address the issue of specificity, we have performed a secondary means of knock-down. To this end, we have employed a dominant-negative mutant of Dishevelled which lacks the PDZ domain (DVL-ΔPDZ) such that it strongly inhibits the PCP pathway with little or no effect on the canonical Wnt pathway (3, 4, 5). When we express this reagent in chick cartilage, we find that its effects on cell behavior are similar to the dominant-negative mutant of Fzd7 (Figure 3E-H) (Supplementary Video 8) (Supplementary Video 9). Finally, we reference previous literature showing that perturbation of β-catenin in both chick and mouse cartilage suggests a function in chondrocyte proliferation and differentiation, but no role in oriented cell division or cell morphology (6, 7). Taken together, these results support a role for the PCP pathway rather than canonical Wnt signaling in chondrocyte column formation. To address this important point, we have now normalized the sub-cellular localization of different Fzd7 mutants to the membrane marker, membrane-RFP (Figure 5—figure supplement 1). The results are similar to that we previously found with phalloidin staining (Figure 5A, 5D). 6) EGTA is a strong treatment, is it reversible? How do the authors know that is affecting only N-cadherin? There is no quantification of this treatment or the N-cad antibody treatment. In addition, there are several dominant negatives of N-cadherin that could be used to strength the conclusion that cell rotation requires N-cad, which is rather weak as it is currently presented. We thank the reviewer for this suggestion and agree that EGTA has broad effect making it difficult to prove its specificity on N-cadherin activity. Hence, these data have been removed from the revised manuscript. We have used Ncad antibody since it has previously been shown to effectively block N-cadherin function in micromass cultures made from chick limb mesenchyme cells (8). We titrated the supernatant containing this antibody and found that cartilage explants incubated in the medium supplemented with a 1:10 dilution became disorganized (Supplementary Video 13). Therefore, we used this culture condition for imaging and quantitative analysis (Figure 6I, 6J). As a secondary means of knock-down, we have now added a previously established dominant-negative mutant of N-cadherin (9). The results show that sister cells ectopically expressing this protein become separated over time (Figure 6K, 6L) (Supplementary Video 14), similar to effects with Ncad antibody. We thank the reviewer for suggesting the use of the dominant negative construct. We apologize that this was not more clear. Comparing Figure 6A and Figure 6C, the expression level of junctional Ncad is reduced in the cells expressing an intact Fzd7. To clarify this finding, we now quantitate this difference by performing fluorescence intensity analysis of junctional Ncad (Figure 6D). These data are consistent with our model in which high PCP activity down-regulates the amount of junctional Ncad. 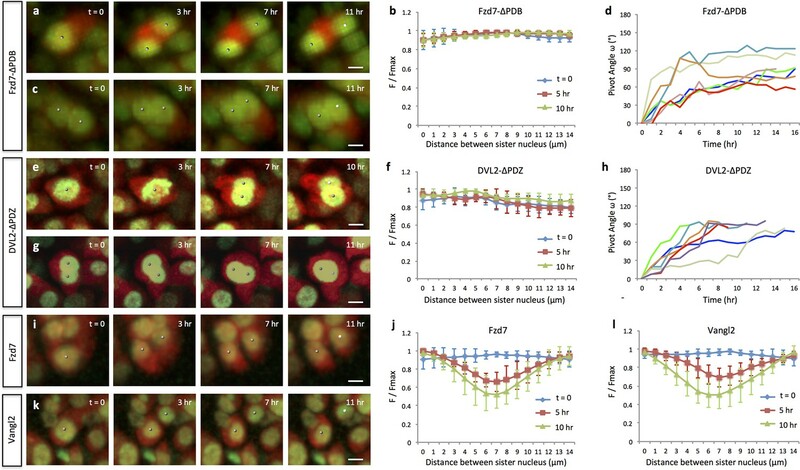 8) The authors mention that reduction of N-cadherin between sister cells induced by Fz7 leads to cell separation and they refer to Figure 5F and Video 14, but I cannot see any cell separation at all in this figure or video. We thank the reviewer for pointing this out. 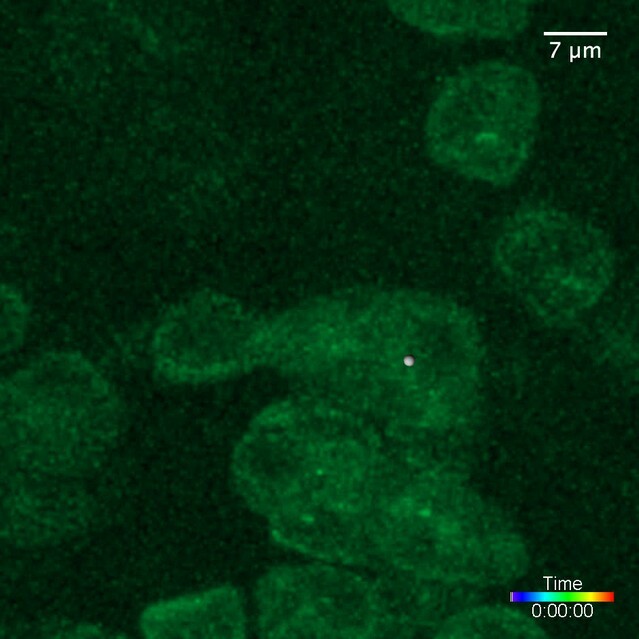 To address this, we have now extended our imaging session to clearly show that sister cells are separated (Figure 6G) (Supplementary Video 16). We thank the reviewer for pointing this out. To address this, we have now measured the fluorescence intensity of the sister cells expressing cytoplasmic mCherry. If sister cells are separated after cytokinesis, mCherry intensity should significantly drop in the middle of the cells; otherwise, this value should remain more or less constant (Figure 2B). The results show that wild-type cells (Figure 2C), Fzd7-ΔPDB expressing cells (Figure 3B) and DVL-ΔPDZ expressing cells (Figure 3F) are associated; in contrast, Fzd7 expressing cells (Figure 3J), Vangl2 expressing cells (Figure 3L) and cells with inhibited Ncad functions (Figure 6J, 6L) are separated. This supports the idea that inhibiting PCP signaling causes misoriented cell division, but does not impact sister cell association; in contrast, promoting PCP signaling or inhibiting Ncad activity results in sister cell separation. We thank the reviewer for this important comment and agree that using the term midbody was a misnomer. Rather, we should have called it the cleavage furrow. To address the reviewer’s point, we first tried immunofluorescence experiment on chick cartilage using both phospho-myosin antibody and active RhoA antibody; however, neither of these gave a signal. Therefore, we chose to normalize junctional Ncad signal to phalloidin signal, which labels the contractile ring in the cleavage furrow. In most analyzed samples, junctional Ncad is not located in the cleavage furrow (Figure 6—figure supplement 1). On the other hand, our live imaging analysis on Ncad-GFP expressing cells clearly shows that Ncad is enriched between sister cells after division and during cell pivot (Figure 6E, 6H). These combined data suggest that Ncad is enriched in the post-cleavage furrow and controls sister cell rearrangement. Given the role of PCP proteins in governing actomyosin contraction and oriented cell division, an intriguing possibility is that PCP proteins recruit Ncad to the post-cleavage furrow to establish adherens junctions after cytokinesis and this adhesive interface is critical for subsequent cell rearrangement. To address this interesting point, we have now performed new live imaging to show that junctional Ncad-GFP is enriched in both pivoting wild-type cells (Figure 6E) (Supplementary Video 12) and Fzd7-ΔPDB expressing cells (Figure 6F) (Supplementary Video 15). To address this, we now provide numbers to support the conclusions. As requested, we have now quantified cell separation in all conditions. As requested, we have now measured the fluorescence intensity of both endogenous Ncad (Figure 6D) and ectopic Ncad-GFP (Figure 6H) at cell-cell contacts. Our data support the idea that Ncad is concentrated in the post-cleavage furrow and subsequently maintained in the interface between sister cells. We thank the reviewer for bringing this confusion to our attention, which we hope to have rectified in the revised manuscript. By simple column, we mean columns comprised of clonally related cells that are one cell diameter in width. Complex columns are also mainly clonal but two or more cells wide. To address the frequency of these columns and distinguish between them, we have performed further quantitative analysis. This helps to distinguish columns from non column (Figure 1H) and single column from complex column (Figure 1I). We also measured the orientation of both single and complex columns (Figure 1J). The data support the idea that chondrocytes in the proliferative zone form two types of columns: single and complex, both of which undergo polarized growth. With respect to distinguishing between misorientation and cell shape change, we have now measured these two cellular parameters and shown that mutant cells are misoriented and morphologically more isotropic (Figure 3—figure supplement 1). With respect to the relationship between cell number and cell intercalation, we found that intercalation only occurs between more than two cells as the reviewer suggests. An ideal method to distinguish "complex" columns versus columns that have not finished intercalating” would be to perform clonal analysis and live imaging on the same samples. However, the one-photo laser causes photo-damage to the tissues such that the maximal imaging session is 24 hours or less, which is not sufficient to observe the complete process of cell intercalation in cartilage (2). Therefore, we can only define simple and complex clones in tissues sections. As mediolateral intercalation is well known to be important in cartilage development, we chose instead to focus the current manuscript on determining the mechanism whereby single column formation is regulated, as this is novel. Therefore, our functional experiments focused on perturbing single column formation. We have performed further functional experiments combining clonal analysis and functional perturbation as requested (see below). We thank the reviewer for this suggestion. To address this point, we have now combined clonal analysis with perturbation studies to observe clone morphologies in the tissues expressing either Fzd7-ΔPDB or Fzd7. The results show that many Fzd7-ΔPDB expressing clones form misoriented single and complex stacks (Figure 4A-D); in contrast, Fzd7 expressing clones are comprised of truly disorganized cells (Figure 4E, 4F). These data support a model in which distinct cellular behaviors (oriented division and cell rearrangement) are sensitive to the activity of PCP pathway (Figure 4G). We apologize for this omission. To address this, we have now expanded and clarified the description of different mutations of this construct and other reagents and protocols (See Materials and methods for details). We agree that EGTA lacks specificity so these data have been replaced by using an alternative approach for blocking N-cadherin activity. To this end, we employ a previously established dominant-negative mutant of N-cadherin (9) and show that sister cells ectopically expressing this protein become separated over time (Figure 6K, 6L). To address this, we now present the videos in a more “zoomed-out” view such that neighboring cells can also be followed. Unfortunately, we are unable to perform live imaging on the whole tissue because it requires using low magnification objective lenses, which do not provide sufficient spatial resolution to visualize cell pivot behavior. With respect to following clonal analysis over time, we tried hard to perform live imaging on the explanted cartilage labeled with distinct fluorophores at clonal density, However, the one-photo laser causes photo-damage to the tissues such that the maximal imaging session is only up to 24 hours, which is not sufficient to observe the complete process. We did try to culture whole limb for live imaging, but to no avail as neighboring tissues such as tendon and perichondrium reduced light penetration. Reviewer 1 raised minor concerns and reviewer 2 has major concerns on our quantitative analysis of clone morphologies, especially how to assess complex columns. Reviewer 1: “I am still not completely convinced about the quantification shown in Figure 1, as it is not evident from these data how the distribution of frequencies of simple and complex columns is. However this is now a minor point”. Reviewer 2: “A major issue in the previous version was the distinction between single and complex columns. I'm still not sure of this: I think Figure 1F1 shows a single column (in red) and the text states that Figure 1F2 shows complex columns in "blue and green clones". Then, the authors go on to say the "a minority of complex ones (8%) intermixed with non-clonally related cells (white arrow pointing to the uninfected cell beside the green clone, Figure 1F1)". What is the justification for calling this a complex column? Don't they have any better examples of mixed color complex columns?”. We present representative images (Figure 1F), which are further supported by quantitative characterization of column versus non-column, single versus multi column, column orientation (Figure 1H-J). While a single column (red in Figure 1F1) and a multi column (blue in Figure 1F2) are aligned along the tissue elongation axis, there is also a multi column with shifted orientation (green in Figure 1F2). These representative images are consistent with quantitative analysis of column orientation (Figure 1J). We agree that our quantitative analysis is not sophisticated enough to discriminate complex columns at potentially distinct dynamic states, i.e. whether they are stable, intercalating or disorganized ones. Hence, to more accurately describe clone morphologies, we rephrased “complex columns” into “multi-column clones”. Additionally, we better emphasize the novelty of our study and clarified that our study is focused on single column formation (Introduction section and subsection “Inhibiting PCP signaling disrupts oriented cell division, but not cell pivot behavior”). Such changes do not weaken our conclusion on the major part of the story. Although we agree that such a “snapshot” experiment could provide novel insights into the dynamic process of multi column formation, unfortunately, it is not technically feasible given current technology. Explant cartilage cultures tend to drift and rotate during their growth. Further complicating this experiment, following live tissues using snapshots for several days would require changing culture media and constantly transferring explant culture from the incubator to the microscope stage and back. These processes cause tissues to move and would make it impossible to follow the same clones. Rigorously performing such experiments requires the development of long-term limb culture. To our knowledge, there is no literature on maintaining normal tissue growth over such a long-term period. Moreover, characterizing the behavior underlying mediolateral intercalation will require two-photon live imaging and perturbation studies to clarify the cellular and molecular mechanisms. These experiments would warrant a full paper on their own and would take considerable time to accomplish. For these reasons, we have focused the current study on single column formation and cell pivot and the mechanisms underlying behavior. Reviewer 2 doubts that live imaging deepens our understanding of cell rearrangement “The live imaging would be interesting if we could actually see the cell behaviour/morphology (e.g. something sort of hinted at in the pictures of Fzd7-membrane in Figure 5). Instead, we get none of the benefits of following the clones, and very little appreciation of the actual immediate cellular movements ". We partially agree with the reviewer’s statement about using live imaging to follow clones with distinct colors. As we pointed out in our previous response letter, chondrocyte cell intercalation is a very slow process (2) and following it in the long-term will require more advanced imaging techniques than currently available. We appreciate that the reviewer suggests a snapshots experiment, but as discussed above, it has many technical challenges. For these reasons, we toned down our statement about cell intercalation and multi column formation (Introduction section, subsection “Multi-column clone formation appears to involve mediolateral cell intercalation” and Discussion paragraph one). Furthermore, we moved our observation of mediolateral intercalation into the end of the manuscript (Result section final paragraph), and also moved the live imaging snapshots of this cellular behavior into Supplementary Data (Figure 2—figure supplement 2). These rearrangements will focus readers’ attention on cell pivoting and single column formation. We disagree with the reviewer’s general statement about the application of live imaging to studying chondrocyte behavior. Our work shows that live imaging provides a direct means to visualize the sequential steps of single column formation: oriented cell division, sister cell association and subsequent cell pivoting. Such a dynamic process could only be inferred from static studies. Ours is the first work that definitively explains this process in limb skeleton. Importantly, we quantitatively demonstrate that cell pivoting is a not a classical mediolateral intercalation process, as reviewer 3 has pointed out in his previous comments (“To be clear, this behavior between new sister cells does appear to me as a distinct behavior from the other intercalations shown, but i think the term "rotation" does not capture it”). With this dynamic imaging approach, we were able to dissect the influence of the PCP pathway on the distinct steps generating single column formation. Finally, doing the single color clone in the PCP perturbations is also not very satisfying, for the same reason above, as it is difficult to understand which columns are "complex stacks" and which are "disorganized”. We performed multiple-color clonal analysis in the PCP perturbations (Figure 4) as the reviewer requested in his/her previous comments. We agree that it is difficult to distinguish complex (multi) and disorganized columns in the PCP perturbations; hence, in the text of the revised version, we highlighted the morphologies of single-row clones (subsection “Inhibiting PCP signaling disrupts oriented cell division, but not cell pivot behavior” paragraph three). Mediolateral intercalation has been demonstrated during limb cartilage growth in higher vertebrates as well. In mouse, static imaging of clones with lacZ staining strongly suggests that chondrocytes undergo an intercalation process (1). Since the labeled patches displayed more than one cell diameter in width, it is consistent with a model in which multi column formation is likely driven by mediolateral intercalation. Furthermore, it has been shown that this step is regulated by the function of proteins attached to the cell surface via glycosylphosphatidylinositol (GPI) linkages. In chick, live imaging and quantitative analysis has clearly demonstrated that mediolateral intercalation occurs in limb cartilage (2). In our view, the next challenge is to combine clonal analysis, live imaging and quantitative approaches to understand how clonal heterogeneity drives complex clone structure. As we stated above, such a study needs both new reagents and tools, and is outside the scope of the current work, but the toolkit we develop here builds a critical foundation for future mechanistic studies of chondrocyte clones with complex morphologies. We normalized the signal of junctional Ncad signal to total Ncad signal (Figure 6 legend) (Figure 6D). 1. Ahrens M, Li Y, Jiang H, Dudley AT. Convergent extension movements ingrowth plate chondrocytes require gpi-anchored cell surface proteins. Development 136, 3463-74 (2009). 2. Li, Y. Trivedi, V. Truong, T. Koos, D. Lansford, R. Chuong, C. Warburton, D. Moats, R. Fraser, S. Dynamic imaging of the growth plate cartilage reveals multiple contributors to skeletal morphogenesis. Nat Commun 6, 6798 (2015). 3. 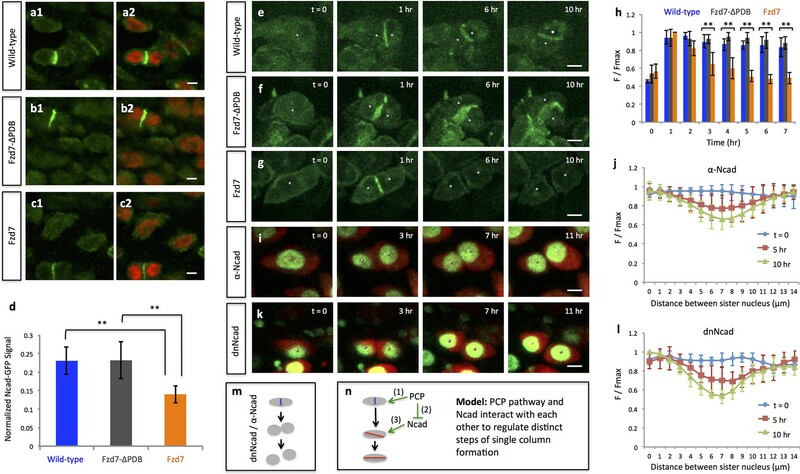 Axelrod, J. D., Miller, J. R., Shulman, J. M., Moon, R. T. and Perrimon, N. Differential recruitment of Dishevelled provides signaling specificity in the planar cell polarity and Wingless signaling pathways. Genes Dev. 12,2610 -2622 (1998). 4. Krasnow, R. E. and Adler, P. N. A single frizzled protein has a dual function in tissue polarity. Development 120,1883 -1893 (1994). 5. Rothbacher, U., Laurent, M. N., Deardorff, M. A., Klein, P. S., Cho, K. W. and Fraser, S. E. Dishevelled phosphorylation, subcellular localization and multimerization regulate its role in early embryogenesis. EMBO J. 19,1010 -1022 (2000). 6. Li,Y, Dudley, A. Noncanonical frizzled signaling regulates cell polarity of growth plate chondrocytes. Development 136, 1083-92 (2009). 8. Oberlender SA, Tuan RS. Expression and functional involvement of N-cadherin in embryonic limb chondrogenesis. Development 120, 177-87 (1994). 9. Kintner C. Regulation of embryonic cell adhesion by the cadherin cytoplasmic domain. Cell. 69(2):225-36 (1992). This project is supported by DE024157 to MEB We thank Professor Carlos Lois, Professor Cheng-Ming Chuong and Caltech Biological Imaging Facility for sharing equipment.